Navajo Globe Willow This tree is an ‘Idaho Preferred’ Plant. Navajo Globe Willow looks as if it's been sheared into a perfect ball. It has a fast growth rate and is adaptability to a wide range of soil conditions. 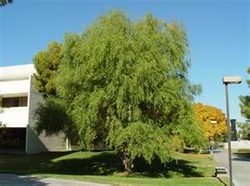 This is one Willow that can take drought, and also performs well in wet locations. Navajo Globe Willow likes to be planted in full sun or partial sun. The flowers are catkins produced early in the spring. The green leaves have a silvery underside. The leaves turn yellow in the fall. Keep away from septic systems. Navajo Globe Willow is also a Firewise plant and it attracts bees when in bloom.